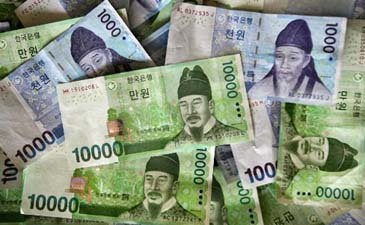 South Korean banks' total earnings tumble against backdrop of increased loan-loss reserves. South Korean banks' total earnings tumbled 36.2 percent on-year in the first nine months of the year due to increased loan-loss reserves, the financial watchdog said on Nov.11.. The combined net profit of 18 commercial and state-run lenders reached 8.4 trillion won (US$6.25 billion) in the January-September period, compared with 13.2 trillion won the previous year, according to a preliminary estimate by the Financial Supervisory Service (FSS). "The weaker earnings came as local banks' loan loss reserves increased due to higher distressed loans," the watchdog said. Such reserves amounted to 4.7 trillion won in the first nine months of the year, up from 2.5 trillion won a year earlier. Lenders' combined interest income rose 5.9 percent on-year to 24.2 trillion won while non-interest income declined 50.1 percent to 4.7 trillion won amid slumping stock markets, the FSS said. Meanwhile, South Korean banks' financial health deteriorated in the third quarter from three months earlier as their equity capital fell due to higher valuation losses from securities investment while the percentage of risky assets rose. The average capital adequacy ratio of 18 commercial and state banks came in at 10.79 percent as of the end of September, down 0.57 percentage point from three months earlier, the FSS said. The ratio, a key barometer of financial soundness, measures the percentage of a bank's capital to its risk-weighted credit. The Swiss-based Bank for International Settlements (BIS) advises lenders to maintain a ratio of 8 percent or higher. All local lenders are obliged to abide by the New Basel Capital Accord, also known as Basel II, which calls for more rigorous risk and capital management requirements. The FSS has recently decided to postpone the implementation of Basel II by one year to 2010. The fall in the capital adequacy ratio came as local lenders, whose debt level remains at a high level, have been suffering from a global credit crunch and the slowing economy. The bad loan ratio of South Korean banks' lending climbed in the third quarter, adding to worries over their asset soundness. The non-performing loan ratio for 18 local lenders reached 0.81 percent as of the end of September, up 0.09 percentage point from the end of last year, it added. Bad loans or loans classified substandard and below are debts that are overdue for over three months. The non-performing loan ratio refers to the ratio of bad loans to aggregate lending. The watchdog said local lenders still have sufficient capacity to absorb possible losses given their higher loan loss reserves and net earnings.